This is the first in a series of blog posts throughout May addressing labour conditions and non profits. Follow us on Facebook and Twitter to keep up to date with our other articles! Across North America, campaigns for a $15 minimum wage have made significant gains. 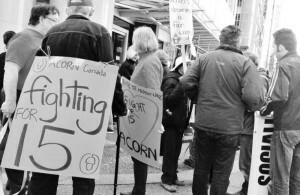 In Canada, New Westminster was the first city to implement a living wage—of more than $20/hour, for any one who works for, or contract with, the municipality. Recently, California and New York both announced 15$ minimum wages—albeit implemented incrementally, with longer timetables for certain small businesses. Even with these limitations, the Fight for $15 is an inspiring example of coalitions of community groups and labour winning gains for working people. 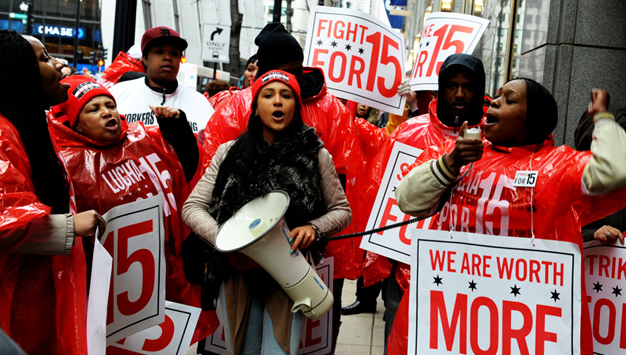 These victories are a direct result of campaigning by low-wage workers and their allies. In a time in which the social and economic agenda is shaped by the interests of corporations, and increasing inequality, the Fight for 15$ campaign is a breath of fresh air. Why $15 and Why Now? Currently a full time job at minimum wage keeps workers below the poverty line. Compounding the issue, more jobs are precarious, with more and more people working on temporary contracts and facing unstable and irregular work hours. Restructuring jobs to be less reliable has been a conscious strategy of businesses, and has allowed them to grow profit at the expense of employees. Governments remain complicit in this process, both actively supporting it (in particular through unfair taxation) and pretending ignorance of these new labour practices and abuse– patterns laid out in reports like this, this, this and this. The complexity of these issues in Quebec particularly is captured in the research done by Institut de recherche et d’information socio-économique. Their report shows not only the need for a $15 minimum wage—but also that in many situations (single parenthood or having less than full time work, for example) 15$ would not be adequate. It is, truly, the minimum—and it is long overdue. To make matters worse, austerity policies have made cuts to programs aimed at alleviating poverty. Community organizations, social movements and unions have already played defense for these programs, fighting to protect a minimal social safety net. The Fight for $15 is the same coalition going on offense—to actively improve conditions for low-wage workers. 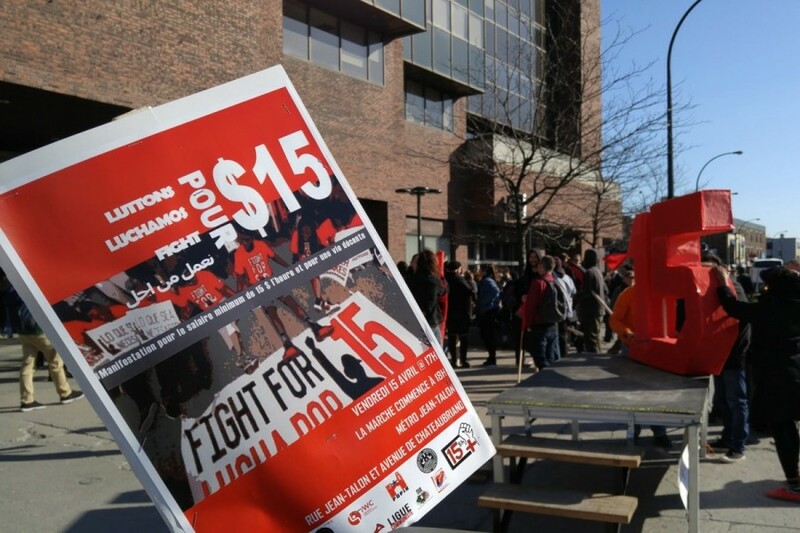 In Quebec, the Coalition Against Precarious Work, organized by the Immigrant Workers Centre, launched its campaign for $15 an hour minimum wage, and has been joined by many other organizations and unions. We are at the beginning of this struggle, and want you to become part of it. Set up a $15 committee in your workplace, or invite the Immigrant Worker’s Centre to do a workshop with your members. Stay in touch with the campaign in Quebec here. Eric Shragge is President of the Board of Directors of the Immigrant Worker’s Centre in Montreal. Resource on Social Media for Small Non Profits Labour Politics in Non Profit Organizations: What’s the deal?